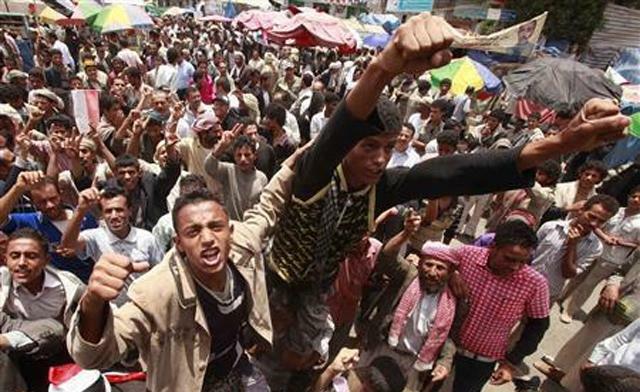 Hundreds of thousands of protesters flooded the streets across Yemen on Sunday to demand the ouster of President Ali Abdullah Saleh on the anniversary of his rise to power in 1978. Dozens of tents have been erected in Tel Aviv, with plans for further encampments in other Israeli towns and cities, to protest high house prices. Several Indian and Pakistani citizens Saturday gathered near Rajghat, Delhi and formed a human chain on Saturday to protest the July 13 Mumbai blasts that left at least 19 people dead and injured 130. Journalists at the BBC walked off their jobs Friday to protest planned job cuts as a result of lower government funding. Greenpeace activists dressed as polar bears occupied the Edinburgh offices of Cairn Energy on Monday as the environmental group stepped up the pressure on the company over its Arctic exploration plans. Around 2,000 farmers, backed by student groups and academics gathered in front of the presidential office in Taipei late on Saturday to protest government proposals that would make it easier for farm land to be forcibly turned over to developers. Around 200 people gathered at the Jordan Press Association headquarters earlier today to denounce an attack on journalists by riot police on Friday. Greek taxi drivers blocked roads to Athens’ airport and main harbor today, holding up thousands of tourists at the start of a two-day protest against plans to liberalize their trade. Several hundred people attended a protest march against the EU-IMF austerity programme in Dublin on Saturday.